There are many reasons why you would want to make a homemade soup. Not only is it easier than you may think, it's also healthier and far better tasting. Plus, you can control every ingredient. This means you can customize it to your family's taste and choose meats, vegetables, and starches that reduce calories, carbs, and sodium that can sabotage a healthy diet. In comparison, soup from a can is often disappointing. They're filled with mushy vegetables, tiny bits of meat, and dull flavors. They also tend to be filled with a considerable amount of salt. If you're concerned about the convenience factor, make a larger batch. Your nutritious, delicious homemade soup can easily be frozen and reheated for a quick meal. While you can use a recipe, soups can be made without one. Simply gather the essential ingredients, get creative with leftovers and seasonal vegetables, toss it all in a pot, and let it simmer. The broth is the background flavor for the rest of your ingredients. Chicken, beef, and vegetable broths are the most common and can be chosen to fit the soup. You can use beef broth for beef stew or beef and barley soups. Chicken broth is perfect for chicken noodle soup and seafood chowders. A vegetable broth is an ideal base for vegetable and bean soups. Homemade broth is the most flavorful and it's not difficult to make. Simply add your ingredients to a pot of water and let it simmer for awhile. Strain out the solids and it's ready to use as a base for your soup. It can also be stored in the refrigerator or frozen for long-term storage. Canned broths, bouillon, and powdered soup bases are available at the grocery store. The flavors range from fairly tasty to less than desirable, but they are convenient. Read the labels because some broths can have a significant amount of sodium. Once you find a brand you like, keep a few quarts on hand for a spur of the moment soup. If you're using a recipe to make your soup, it will tell you how much broth to use. If you're making it up as you go, start with 6 to 8 cups of broth in a large pot or slow cooker, and let it simmer as you add the ingredients. You can add more broth later needed. The average soup serving as a side dish is between 3/4 and 1 cup. When the soup is served as the main course, plan on about 1 1/2 cups per person. The healthiest soups have a lean protein source, lots of colorful vegetables, and sometimes a source of starch. It is a balanced meal in a bowl. Lean cuts of chicken, turkey, beef, lamb, or pork and legumes add flavor, protein, vitamins, and minerals. Legumes also provide a nice serving of fiber. There's an almost endless list of vegetables that can be included in a healthful soup. Carrots, onions, green beans, kale, celery, broccoli, parsnips, zucchini, or whatever you like. They're all good because they're loaded with vitamins, minerals, and phytochemicals. Tomatoes and mushrooms are good for soups too. For a starch, you can add potatoes, noodles, or rice. The goal with soup is to cut everything into spoon-sized pieces, so it's easier to eat. Some ingredients should also be pre-cooked. While there is a bit of prep work, it's worth it. Cut your meats into bite-size pieces and brown them in a pan before adding them to your soup. This gets rid of some of the extra fat, creating a leaner soup. Clams or other types of seafood can be fresh or you can use a pre-cooked, canned version. You don't need much protein because you want to save room for the vegetables. For 8 ounces of broth, plan on 1 or 2 cups of chopped, cooked meat. Dry beans and lentils should be cooked ahead of time. You can also buy canned beans that are ready to use. Pour canned beans into a colander and rinse them before adding them to your soup to remove any excess sodium. Select your favorite veggies, cut them into bite-sized pieces and add them to your soup. You can choose several different kinds veggies or just one or two, depending on your mood, what's in season, or what you have in stock. A cup or two of vegetables should be enough for 8 ounces of broth. For aromatic vegetables, such as onions, garlic, celery, and carrots, it's best to lightly sauté them in a little olive oil first. This will make your soup more flavorful. It's also a good idea to cook any other hard vegetables before adding them to the pot so they're a bit softer. When adding a variety of vegetables, think about how long each needs to cook for. If, for instance, you add peas and carrots, the peas can be added to the pot later because they take less time to cook. Potatoes are prepared just like the other vegetables. Choose red potatoes, or at least avoid the Russets because they're too starchy and will fall apart in your soup. Leaving the skins on adds fiber to your soup, which can slow down the starch conversion to glucose that can spike blood sugar levels. You can also skip the potatoes and add another starch, such as barley, pasta, or rice. Don't add too much because these will expand as they cook. Generally, about a cup of dry starch is enough. You can also add them later and cook them just long enough so they're tender. Your soup might still be a little drab and it can be spruced up with your favorite seasonings. It's often best to let your soup simmer for a while and add the seasonings toward the end. This allows the flavors of your proteins, vegetable, and starches to develop and you'll have a better idea of how much seasoning to add. Thyme, oregano, sage, parsley, and bay leaf will work with most soups. Remember to remove the bay leaf before serving. Add salt sparingly, especially when using a prepared broth, which may already have enough sodium. Black pepper can also be added to taste. Finally, let your soup simmer—don't boil it—until it's ready to eat, then serve it with a nice little salad or some fresh bread. When you're taking the time to make soup, it's often best to double or triple the recipe so you can store the leftovers. Let a large batch cool completely before placing it in the refrigerator or freezer. Divide it up into meal-sized servings and place each into a jar or plastic storage bag. Leave enough room for expansion, especially if you're freezing it. If you're planning meals and want to include noodles or rice, you might find it best to not add them to soup you're going to freeze. They can get mushy after thawing. Instead, add fresh noodles or rice to the soup as you warm it up, the heating time should be just about perfect to cook them. In the refrigerator, a homemade soup should be good for up to three days. Frozen homemade soups will keep for up to three months. 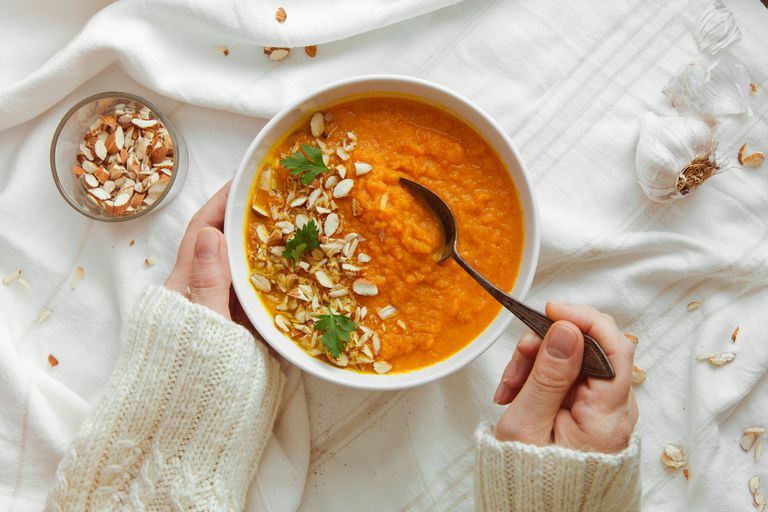 If you don't feel like winging it, here are several easy soup recipes that feature healthful ingredients. Notice they all feature a clear broth; creamed soups are delicious, but they're also high in fat and calories. Once you discover just how easy it is to make soup at home, you might be making it more often. It's a fantastic comfort food for colder months of the year and a few hours of work can set you up for many future meals. Best of all, you can adapt it to fit your family's diet and feel good about what goes inside it.